The Invoiced team is always hard at work building new functionality that makes it easier AND faster for our customers to get paid. We’re thrilled to share the results of our efforts! Take a look at our hit list of recently-released features that are sure to make your day. Automated late fees allow businesses to configure late fees on a one-time or recurring basis when an account is set up, and never worry about them again. That means no more manual processing of late fees - or missing out on additional revenue when customers miss payment deadlines. Remember that estimate you sent out over a year ago? Your prices have increased significantly since then, right? With expiring estimates, you can set customized date ranges for each estimate so they are only valid within the specified timeframe. Sign-up pages offer lots of value in a compact package. Businesses can skip the added step of contract signature by offering contractual terms and payment options - all in one form. And what’s more: now Invoiced customers can offer multiple subscriptions on one sign-up page,and Autopay on sign-up pages as well. Invoiced has always offered templated invoicing emails with a series of customizable variables, and we’ve recently expanded the number of email variables customers may use. In addition to all the existing inputs, choose from new variables such as the start and end dates of an invoicing period, the customer’s account balance, and any credit balances. Your customers can make payments via Invoiced using a variety of payment gateways. Why not make it easy for Invoiced administrators to make payments on behalf of customers? Introducing the virtual payment terminal inside the Invoiced application, where business can apply payments to specific invoices. 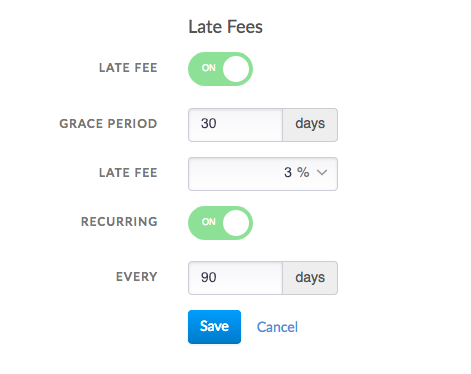 Invoiced’s chasing function allows businesses to create automated follow-up rules for invoices. These follow-up rules will then generate a customized email to each customer. But what if the business doesn’t want to send an email? Introducing invoice flagging, the ability to flag invoices based on the same variables as chasing. Invoice flagging allows businesses oversight into customer behavior, and the power to decide how to follow up (email or otherwise). Invoiced offers comment functionality on invoices, which is an effective way to keep track of customer communication in a centralized place. But with hundreds or even thousands of invoices, it’s tough to keep up. Invoiced now offers a comments queue, where any invoice receiving a comment is flagged so the business can easily find all comments and respond. Companies are scrambling to adapt to the recent changes to GAAP revenue recognition and contract revenue management. In addition to subscription billing, Invoiced now offers contract billing to provide a more flexible method to allocate charges across a customer’s contracted time period. Invoiced connects directly to QuickBooks Online and Xero to push payments from Invoiced to those respective systems. However, users can also pay invoices in QuickBooks Online and Xero, outside of the Invoiced application. We’ve enhanced the connection so that payments from QuickBooks Online and Xero are pushed to Invoiced. In addition to syncing A/R invoices, the Invoiced/Sage Intacct integration now allows Sage Intacct customers to push sales documents with custom transaction definitions directly to Invoiced. Tell us what you think of the new Invoiced features. Take advantage of all the Invoiced has to offer with our latest enhancements. And when you do, tell us what you think! Feel free to send us comments, questions, and new ideas at support@invoiced.com.